The monks and the Sacred Stream community gathered to celebrate Geshe Thupten Jinpa. The monks arriving at SFO. En route to the Sacred Stream Center. Geshe Lobsang Choephel (spiritual master of the tour). 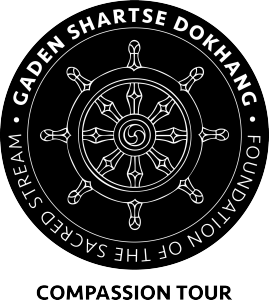 Geshe Lobsang Dhonye (chanting master of the tour). Taking in the beauty of the Painted Hills. In ceremony at the Paintd Hills. With a police officer in Bend, Oregon. Geshe Thupten Jinpa La (translator of His Holiness The Dalai Lama). Dr. Isa Gucciardi and Laura Chandler with Geshe Thupten Jinpa. Wangdu and Nima created these butter sculptures for the Sacred Stream Center. Geshe la with a fascinated 4th grader. Butter sculpture is an ancient art form passed down thru generations of Tibetan monks. Wangdu and Nima making butter sculptures. Butter sculptures are an ancient tradition in Tibet. These intricate offerings are made by Lamas skilled in the art. Monks en route to the Sacred Stream Center. The monks visit the redwoods at Muir Woods. Monks making friends at the Golden Gate. The monks visiting The Berkeley School. Monks high-fiving at The Berkeley School! Geshe Dhonye with Karin Mellberg (Bend tour coordinator). The monks visit AT&T Park. With Michael Franti in Bend, Oregon. Performing with Michael Franti in Bend, Oregon. In the moutains of Oregon. A Children's Blessing ceremony in Bend, Oregon. The monks with Sacred Stream Founding Director Isa Gucciardi, Ph.D.
An in-progress Sand Mandala at the Sacred Stream Center. At SFO, with Laura Chandler and Isa Gucciardi. Laura Chandler introducing the monks at the Berkeley Himalayan Fair. In ceremony at the Painted Hills. A shrine at the Sacred Stream Center in Berkeley, CA. Performing Tibetan Opera at the Sacred Stream Center in Berkeley, CA.